Some artwork has appeared on Weta Workshop's website for the intriguing horror movie Black Sheep which I understand is being shot around Wellington over the summer. 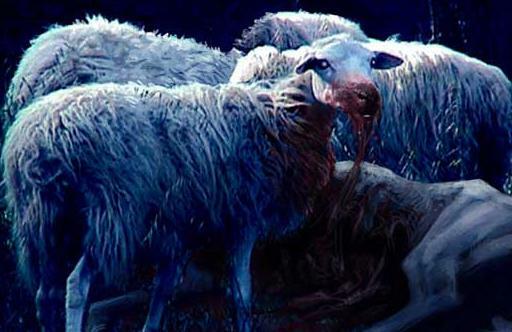 According to the Film Makers, Black Sheep tells the story of "a genetic experiment gone horribly wrong; the sheep start turning nasty and it’s the people that begin to bleat." It's a horror comedy written and directed by first timer Jonathan King and produced by Philippa Campbell (Rain, No. 2) and should do nicely off the momentum created by Australian horror Wolf Creek which is reportedly so graphic and convincing some viewers have had to leave the theatre during viewings. Black Sheep is interesting for a few reasons. Weta's involvement obviously lends a lot of credibility to the project and you can bet the mutant sheep they come up with will look fantastic. The few bits of artwork Weta is showing off have an incredibly menacing look, like Footrot Flats gone wrong. 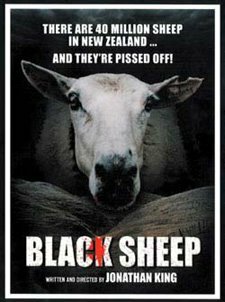 Richard Taylor, Peter Jackson's right hand man, is overseeing the making of the killer sheep and sees Black Sheep as harking back to the Brain Dead and Bad Taste splatter days. "It's wonderful for us, because it affords us the ability to go back to our roots, to go back to animatronics. It will be mostly done with puppetry and animatronic work. The script is beautiful, and that's where it all starts. It's funny. It's scary. It's wonderful fun, with crazed, bloody, animatronic sheep. The deadline is very, very short, so we have to bring all of our innovative thought to bear on it, but we're all excited about it." It's also interesting because it's backed by the New Zealand Film Commission. This project and the vampire thriller Perfect Creature show more than any other productions the commission has been involved with yet that they're willing to punt on very commercial movies. It's also one of the first New Zealand films financed through a Korean co-production, in this case with the Daesung Group, which put money into the cult hit Old Boy (but also the clanger Around the World in 80 Days). Hopefully this type of funding continues. Black Sheep has aleady been pre-sold to the distribution company Icon for territories including the United Kingdom, Australia and New Zealand and three Asian territories have already been sold. That was all wrapped up before the movie had even gone into production which is impressive. The script and concept art must be fantastic.